Yes, I know this stuff isn’t good for you. And I know it’s particularly unhealthy to eat it straight out of the bag, uncooked, in front of the tv. Amazingly, I still lost 23 kg over the last 11 months, while buying this stuff by the case. I probably go through one of these every two weeks. I never prepare it in a soup. I either eat it straight out of the bag (bad), or crush it into my favourite Chinese no-chicken salad (good). There are 12 x 85g packets in the case, totaling 1.02 kg. 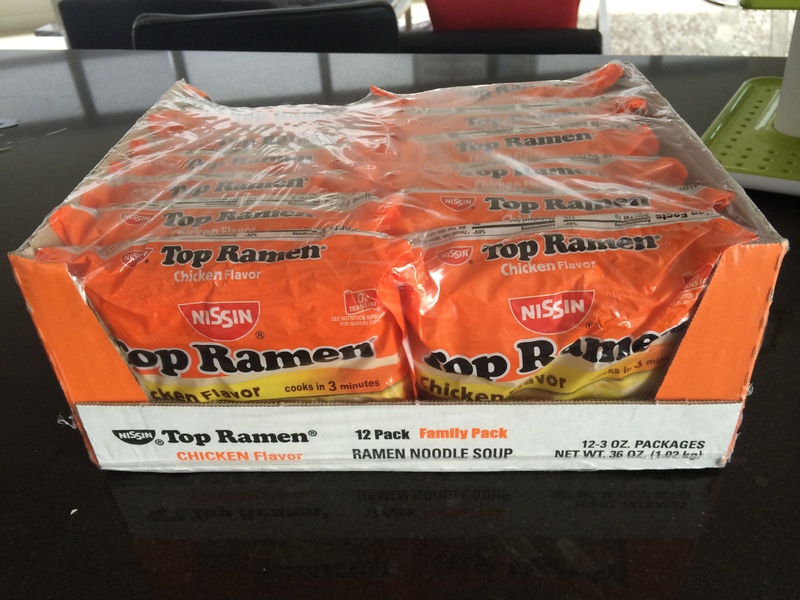 A kilo of pure carbs has 4000 calories, but since the Top Ramen noodles are fried, the case has 4300 calories. That’s not too bad at about 300 calories/day.